I caught up with Whitta to chat about his new novels, Inkshares, and what he learned from writing a Star Wars film. Aidan Moher: Hello, Gary! Abomination is a weird, horror-filled medieval fantasy set in an alternate history version of England where magic still lives in the open. What can readers expect from Whitta’s England? Gary Whitta: A big part of the fun of writing this book came from mashing up real history and fantasy. The Dark Ages is just such a fascinating period in history, and it’s fertile territory for a little bending and re-shaping because the historical record during that period is really spotty, there’s so much historians still don’t really know for sure. So I thought it was a fun opportunity to say, “Well, who’s to say there weren’t insane wizards and abominable monsters running around back then?” But even without the fantastical elements, it’s just such a rich backdrop. We’re talking about a time when England didn’t even formally exist yet as a unified nation, it was a bunch of different kingdoms and a huge swath of territory known as the Danelaw which is where the Vikings who had been invading England for centuries eventually settled. If you look at a map of the British Isles around that time — we have one at the front of Abomination — you recognize the shape of the country, but the borders are so different, the country essentially split into two halves occupied by the native Anglo-Saxons and the Nordic invaders, that it almost seems like a fantasy kingdom. 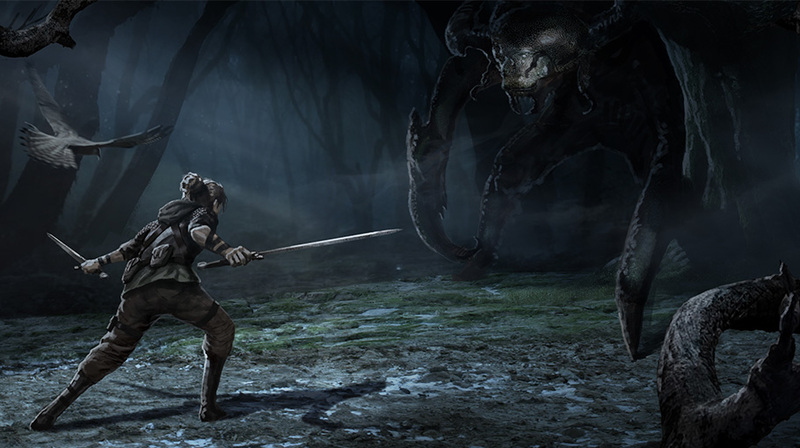 Aidan Moher: Since its early days with Tolkien’s Lord of the Rings, to the enormous uproar in the ’80s, Modern Fantasy has been enamoured with Medieval England as a backdrop. Why is it such an appealing setting for fantasy writers? Gary Whitta:I think because it allows us to create these fantasy worlds that don’t really seem like they’re that far removed from our actual history, and so they seem more believable in a sense. You can watch a few minutes of a movie like Excalibur or Kingdom of Heaven and not know right away if you’re watching a fantasy story or a historical tale. And the medieval era has become such a romanticized period of history — even though it was thoroughly miserable for the great majority of people who lived through it — that it’s been attracting both fantastical and historical storytellers ever since. Aidan Moher: The Abomination Inkshares campaign included this wonderful hook: “Some believe that the true history of this dark age was deliberately concealed by its surviving scholars.” How does Abomination play with the idea of history being rewritten and concealed by victors and biased scholars? Gary Whitta: Yeah, that’s a little passage we have at the front of the book, kind of like the introductory crawl of text you sometimes see at the beginning of the movie. The idea was to plant the idea that this is a story set during a real historical time and place, but an alternate version of that history where you don’t really know what might be possible. The Dark Ages are called that not just because they were very grim — although they certainly were — but because they’re kind of a dark page in history where a lot of information has been lost forever because so much of the written word was destroyed during that time and illiteracy was rampant. People were too busy just trying to survive the aftermath of the fall of the Roman Empire to worry about writing much down. So the idea that this story took place in one of those gaps in history, and that it was so horrible that the scholars and historians of that time had made a deliberate choice not to record it, felt like a compelling hook. Aidan Moher: Abomination is your first novel, but you’ve written several screenplays that fantasy and science fiction fans will be familiar with, including The Book of Eli and Star Wars Anthology: Rogue One, and been involved with narrative-drive videogames, including writing an episode of Telltale’s Walking Dead series. How has working across various narrative mediums helped you to develop as a writer and storyteller? Gary Whitta: I think each time you change mediums you have to go back to the beginning, to some extent. I don’t think the fundamentals of what makes a good story change too much from one medium to another, but how that story gets told is vastly different in a movie than it is in a book or vice versa. That’s why adapting one into the other is often so difficult. Originally my plan was to write Abomination as a film because that’s where I have the most experience, but the demands of the story took me down this other road instead, and so I found myself kind of having to kind of learn a second language, because that’s really how it feels when you move from one medium you’re familiar with to another where you’re a complete neophyte. While I knew that writing in this different form would give me the freedom to tell the story outside of the constraints of a typical screenplay structure, it also meant that so much of what I spent years learning about screenplay structure no longer applied. So it was scary, but I think it worked out in the end. Aidan Moher: Your screenplays, including After Earth and The Book of Eli, tend to be science fiction epics. What drew you to fantasy for your first novel? 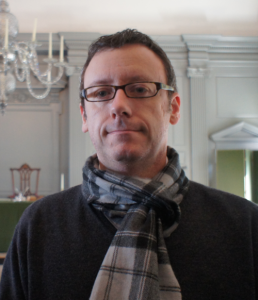 Gary Whitta: It’s more a question of fantasy drawing me to my first novel. I’ve always wanted to tell a big fantasy story. The problem is that while sci-fi is a tremendously popular genre in the movie industry I work in, fantasy is a much, much tougher sell. Think about it: how many big fantasy movies are there really these days, other than those that are based on bestselling books? The idea of trying to sell Abomination to Hollywood as an original fantasy film just felt like a non-starter commercially. But I knew that I could write it as a novel and self-publish it if need be, and that it had a chance of finding an audience that way. Aidan Moher: One of the most interesting things about Abomination is that it’s being published by Inkshares, a service that uses a Kickstarter-like pre-order system to determine which books they’re going to pick up for publication. Inkshares seems like it’s a great place for writers who already have a built-in fanbase. As someone who’d never written or published a novel before, can you describe your experience with Inkshares? Gary Whitta: The Inkshares experience has been brilliant. I originally got some resistance from the traditional publishing houses, who told me that they liked Abomination but didn’t quite know where it would fit in their catalog, I guess because it is this kind of gnarly mashup of different genres; a bit of fantasy, a bit of historical fiction, a bit of horror. Okay, a lot of horror. So I was looking into self-publishing it via Amazon when I heard about Inkshares and I really loved their approach, it combines, I think, a lot of the freedom and autonomy of self-publishing with the benefits of a traditional publisher. Aidan Moher: Would you recommend Inkshares to other first-time novelists? Gary Whitta: Yeah, definitely. When I was first looking at Inkshares, I asked Daniel Wallace, who wrote Big Fish and had just published a children’s book with Inkshares, what his experience was like and he was just gushing with praise. If they’re good enough for Dan Wallace they’re good enough for me. I’ve since had other authors ask me about Inkshares and I’ve been happy to tell them the same thing Dan told me. Aidan Moher: Star Wars Anthology: Rogue One is coming out next year, which is certain to be a big year for you as a screenwriter. Any more novels planned? Gary Whitta: Yeah, I’d love to write another one, whether it’s another book in the Abomination universe or something totally different. I’ve got ideas for both. My main reason for hoping that Abomination is successful is that it would grant me the opportunity to write another book and perhaps open up a second front as an author beyond screenwriting. Writing for Hollywood is always a thrill but it’s also a business that is often brutally indifferent toward writers, and so the idea of having another avenue to tell stories where you perhaps have more creative autonomy is very appealing. Aidan Moher: How do you balance being a novelist and a screenwriter? Gary Whitta: I’m still figuring that out! Ask me again in a year or so. Aidan Moher: Can you recommend any books or movies that readers might enjoy once they’ve devoured Abomination? Any particularly influential works? Gary Whitta: I think if there’s any one author that really inspired me to give this a try, it’s Patrick Rothfuss. His two books, The Name of the Wind and The Wise Man’s Fear just blew me away. If you haven’t read those books yet, go do that now. Aidan Moher: Thanks so much, Gary! Gary Whitta: Thanks to you! 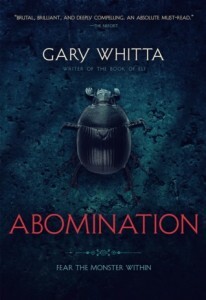 If anyone out there reads Abomination and wants to let me know what they thought of it, I can be found on Twitter at @garywhitta. Abomination is available to purchase on Amazon and directly through Inkshares.